If you’re headed out on one of Arizona State Parks and Trails many shared-use trails, it’s important that you understand trail etiquette — and share your knowledge with others. Good trail management combined with user education means a better time for everyone who uses Arizona’s trails. Not all trails are shared use; some are only for hikers, for example, but when you head out, please practice these principles. If you’re taking a first-timer out, whether it’s hiking, mountain biking, or horseback riding, it’s your responsibility to teach them. Someone educated you, so please pass it on. 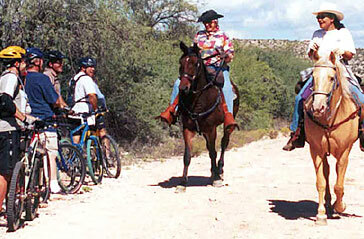 Share the trail: Bicyclists should yield the right of way to those on horseback. Respect other users; expect other users. Show courtesy. Anticipate other trail users around corners and blind spots. Respect wildlife — you’re traveling through their home. Respect public and private property. Leave no trace and pack out litter. Runners and hikers yield to equestrians. Bicyclists should yield to everyone. Downhill traffic should yield to uphill traffic. When in doubt, give other users the right of way. Announce yourself when approaching others, especially from behind. It’s often helpful to give other trail users information such as, “Two more behind me.” Use your voice to warn equestrians, not bells or horns, which may frighten horses. When a horse approaches, move to the safest or most open side of the trail or ask the rider for instructions (typically the downhill side). If you’re in a group, avoid blocking the trail. Use caution and stay extra alert if using headphones or earbuds — you may not be able to hear others. Stay on the trail. Creating your own path or cutting switchbacks creates erosion, damages habitat and natural resources, and creates new trails, which can’t be maintained. Don’t use the trail when it’s wet! Give the trail a chance to dry out and recover after rainstorms. Hoof marks, wheel tracks, and footprints have drastic effects on wet trails, and can begin a process of erosion, which is difficult to reverse. We don’t get much rain here in Arizona, so have patience — a sunny day is just around the corner! Operate within your ability at all times. For example, if you’re new to mountain biking, keep your bike under control. Remember that situations can get out-of-control fast if you’re not attentive! Be considerate; keep dogs leashed and under control at all times. Other trail users don't know your dog is friendly. Be prepared. Don’t become a casualty by heading out unprepared. Bring water, snacks, maps, a light source, matches, and other equipment you may need. Think ahead and bring the essentials. Cell phones are an excellent idea, but batteries can die and accidents can happen in areas with no cell reception. Know where you’re going, and tell someone else your plan. In 2006, the Lime Kiln Trail was completed, linking Dead Horse Ranch State Park (Cottonwood) with Red Rock State Park (Sedona). 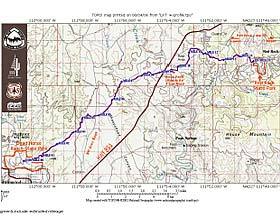 The trail is about 15 miles and follows the alignment of the old Lime Kiln wagon trail. This is a shared-use, nonmotorized and permit equestrian trail. Arizona and Arizona State Parks both offer other great trail opportunities so explore our website for more information.